The Commitments aside, rock novels tend to avoid head-on attempts to convey the most resonant moments of a life in music: the thrill of hearing that first magical album, playing in that life-changing band, or seeing an act at your local watering hole that you know is destined for the big time. The energy of these moments tends to resist the linear form of the written word. Jotting down the way Led Zeppelin II makes me feel inherently flattens the experience. I’d much rather write about the car I’d had back then, the characters in the back seat, the way the night ended. 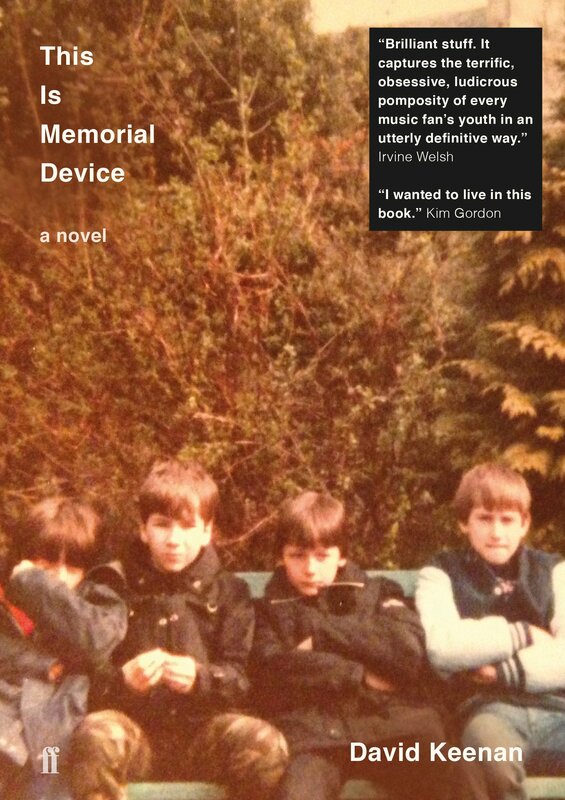 In This is Memorial Device, “the untrue story of the greatest post-punk band in rural Scotland circa 1984,” David Keenan forgoes much of an attempt to render the experience of seeing the titular band, instead favoring a more intimate look into the lives of the people who populated its heyday in the town of Airdrie, Scotland, in the 1980s. The story is broken into sections narrated by local musicians, scenesters, hangers-on. The book reads like an oral history of a percolating time in a music community. Instead of trying to provide a kind of soundtrack in novel form, Keenan lets the music serve as an unheard emotional setting for the myriad recollections and travails of the people who were there at the time. These folks strike me as more provocative than anything that might have happened onstage. In a section recalled by local fan Johnny McLaughlin during a night out with Memorial Device member Remy, Johnny’s high school friend Damien bites through a pint glass and eats a slug. To Johnny, these acts separate his high school pal from the more polished rock star. “Whereas Remy had his script prepared well in advance, Damien’s was more like a desperate improvisation on the very edge of falling apart (which isn’t to slight Remy but maybe Damien was the greater artist).” Keenan shows little interest in giving us Memorial Device rocking for sweaty punters in a crowded club, but it’s doubtful that spectacle would top Damien’s finer moments. The guy should charge cover. Tensions between spontaneous and prepared experience run through the book, and there’s no doubt which the narrators favor. The fictional compiler of this history, Ross Raymond, spells it out plainly. “Looking back I feel I was never really there, that I was storing up all of these experiences, gathering material as opposed to living it, always the author and never the character in the book.” The many narrators recount their stories from safe distances, long after cultivating grownup lives, but they can’t forget the musicians who touched them back then. Their looks back are fond, but also with the annoyance of having missed out. Life winds up with memories equal parts fascinating and self-indicting, and all that’s left to do is admire those who lived it to the fullest and wrestle with what that means for the rest of us. Nowhere does the topple from the heights of rock life come through more than in the section where Monica Lawson chronicles Memorial Device’s drummer Richard running away to serve as an aid worker in Palestine. Such a rash decision is just random enough to feel like an honestly-lived 20-something experience, and Richard’s transformation from rock drummer to someone on the front line of a much more dangerous life doesn’t sit well with Monica, who keeps in touch with him by mail. “Music is always more than life, he wrote … When is life the equal of music, except in memory, except in dreams?” Keenan wants to bring this harsh reality into relief. Rock music, especially the bands and tunes that played during the formative events of one’s adolescence, serves as an unconscious peak to which we aspire for the rest of our lives, and we come back to its visceral memory again and again despite settling into a rhythm that no longer adheres directly to the backbeat of our passions. We listened to Led Zeppelin II. If that sentence doesn’t get you there, I don’t think anything else will. Art Edwards’s reviews have or will appear in Salon, Los Angeles Review of Books, Colorado Review, Electric Literature, Barrelhouse, The Collagist, JMWW, Word Riot, Entropy, and The Rumpus, among others.